You can find links and information you heard about on News 4 on this page. To read the Erie County Water Authority's 2018 report, click on this link. Find more information on Gowns for Prom here. CCCS is offering free counseling to military families and clients in Niagara County for April. For more information click here. The United States Food and Drug Administration (FDA), along with the Centers for Disease Control and Prevention (CDC), and state and local partners, is investigating a multistate outbreak of SalmonellaCarrau illnesses linked to pre-cut melon products. Full list of recalled products. To watch all the Barb's Book Buddies videos, and learn more about how you can get involved, click here. To buy tickets for Throwdown at the Downs 2.0, click on this link. AAP urges recall of Fisher-Price Rock ‘n Play Sleeper after 32 infant deaths. Learn more here. To donate to the Buffalo City Mission, click on this link. To learn more about Feed My Starving Children, click on this link. To donate to the Nashville Children's Alliance, click on this link. The Tall Ships Challenge Great Lakes 2019 event is set to take place from July 4th through the 7th. To learn more about volunteering for the event click here. To learn about joining Americorps, click on this link. Find the New Era 2019 On-Stage NFL Draft Collection here. Erie County Parks, Recreation and Forestry is hiring seasonal employees. Click here for more information on how to apply. Find out what you need to know about getting a fishing license here. To view when and where the trout will be stocked, click on this link. To learn more about Bunny Cares reservations, click on this link. To learn more about the Lewiston Jazz Festival, click on this link. To learn more about the New York State DEC's 2016-2018 Great Lakes Report, click on this link. To learn more about Laced by Liv, click on this link. For questions about identity theft, and what to do if your kid's social security number has been stolen or used for fraudulent purposes Click Here. Find the application for the Buffalo Police Officer Exam here. The 5th Annual Stuff the Sneakers Campaign is now underway I To donate sneakers or personal care items, email Melissa: melissafrawley222@msn.com. To make a monetary donation, click here. Reddy Bikeshare has returned to the City of Buffalo I Click here for pricing information. A group of WNY women started running together to train for local races, but since the inception of their group, it's turned into much more than that I Click here to support their cause. Mississippi Mudds is open every day from 11 a.m. to 8:30 p.m.
To view the schedule for WNY Equifest, click on this link. Find information on the UB Watch Party here. To learn more about Tuesday's local elections, click on this link. For more information regarding St. Patrick's festivities in Chautauqua County, click on this link. To read the NY Attorney General's announcement of the Charter/Spectrum Time Warner Settlement, click on this link. To listen to News 4's interview with Assemblyman David DiPietro, click on this link. The 11 Day Power Play raises money that goes toward cancer research and wellness programs at Roswell Park, Camp Good Days and Make-A-Wish WNY. A 13-year-old's team is now leading the pack in fundraising for the event. I Cick here to donate to Hannah Lockwood's cause, and click here to learn more about volunteering. Learn more about the Buffalo Bisons' Family Day Open House here. See the fundraiser for The Unit Promise here. To take a survey on the Indoor Public Space at the Albright-Knox Art Gallery, click on this link. To learn more about the Hospice Spring Bouquet Sale, click on this link. To learn more about adoptions, donations, or volunteering at A Purr-fect Fit Animal Rescue & Adoption Center, click on this link. To learn more about the push to decriminalize prostitution in New York, click on this link. To donate to Bella's Bumbas, click on this link. Learn more about an opportunity to skate for free at Canalside here. The restaurants and deals for this years' Black Restaurant Week can be found here. Three students at Mount St. Mary Academy created a cognitive coloring book for those living with Alzheimer's disease I For more information on the book, click here. The Hull House Foundation is looking to buy a 12-foot wagon to add to the historic property in Lancaster. The Hull House is the oldest restored stone dwelling in Erie County I For more information on how you can help them get the wagon, click here. Learn more about the Community Foundation for Greater Buffalo here. To learn more about the Olmsted Center for Site, click on this link. UB's Educational Opportunity Center is offering tax preparation services through the end of tax season I For more information, click here. A local woman is urging people to learn how to perform CPR, after her son stepped into action when her heart stopped. | For a list of classes through the local Red Cross, click here. For more information on how you can watch local teen, Jesse Kirchmeyer, race locally at the Snocross National, click here. To donate to Jessica Cameron's fundraiser, click on this link. To make an appointment to donate blood with UNYTS, click here. Blood donation centers will be open from 7 a.m. - 2 p.m. on Saturday. The Community Foundation for Greater Buffalo announced it's awarding $1 million in grant money to 'change makers' in the area | To nominate someone online, starting Feb. 11, click here. The SPCA Serving Allegany County says 140 animals were taken from two locations in the Town of Wirt. To learn more about the seizure and how to donate to the SPCA, click on this link. Breadhive Bakery and Cafe is selling SUPER pretzels for Super Bowl Sunday | To order the three-pound pretzel, click here. The Paws for Love program has about 500 volunteers/dogs who go to more than 100 area schools, courts, group homes and more | For more information, click here. The annual Winterfest, in the Town of the Tonawanda, is now underway | For a look at all the activites this holiday weekend, click here. The owner of Share Kitchen and Bar Room has opened a first-of-its-kind mobile bar room | For more information on the watering hold on wheels, and booking information, click here. The Aquarium of Niagara is offering $7.16 admission for everyone Saturday, January 19th through Monday, January 21st for 716 Weekend. | Click here for more information to plan your visit. The Orchard Park School District is inviting parents to a mental health awareness series, after an uptick in kids have sought help from counselors, social works and phsycologists at the district. | Click here for information on the first presentation, held on Jan 15, and Jan 31 | Click here for information on a documentary screening in February | And keep an eye on the school calendar for a date for a second documentary screening in March. To register for the Nurturing Fathers program, click on this link. Find more information on the Play Everywhere Challenge here. Learn more about Buffalo Collective here. To learn more about Little Smiles of Western New York, click on this link. Girl Scout cookie season is officially underway. To find Girl Scouts selling cookies near you, go to www.girlscoutcookies.org or use the Girl Scout Cookie Finder app, free on iOS and Android devices. To learn more about joining Girl Scouts of Western New York, click here. To learn more about a fundraiser for a firefighter injured in a Butler Avenue blaze, click on this link. The Changing the Face of Beauty organization holds headshot clinics for models with disabilties around the world | Click here to learn more. A local artist is going viral, for her bright watercolor portraits of people's pets | For more information on Shaunna Russell and Weekday Best, click here. Canisius College is memorializing a former student, by creating the 'Scuba Zone' on campus | For more information on the mentorship program, and to donate to the cause, click here. An upcoming festival in Buffalo puts focus on living a healthy, balanced life | For more on 'Live Well Buffalo' click here. Fantastic Friends of WNY is celebrating the grand opening of its new special needs center at 1284 French Road in Depew from 5:30-7:30 p.m. Monday. | Click here to learn more about what the program offers. A Niagara Falls family runs A Free Helping Hand out of the storefront at 1745 Whitney Avenue. It's open on the 2nd and 4th Saturdays of the month for most of the year, and the 2nd and 4th Wednesdays of the month during the summer. | Click here to learn more. If you'd like Red Cross volunteers to come by your home as part of the Sound the Alarm campaign, you can call (716) 886-7500, email smokealarms.wny@redcross.org or register online at soundthealarm.org/wcny. You can also donate to the Red Cross online, by calling 1-800-HELP-NOW, or texting REDCROSS to 90999 to give $10 to American Red Cross Disaster Relief. The partial government shutdown continues today | For details on E-Verify services that are unavailable, click here. Today marks the start of Kwanzaa | For a full list of events, during the nearly week-long holiday, click here. Many of you are throwing things away after Chrsitmas, but the City of Buffalo asks you to recycle what you can | For a full list of what can be recyclced, click here. To donate to Wheels for the Ward, click on this link. To donate to the Upstate NY Salvation Army, click on this link. Angelo Sarkee continues to collect returnable bottles, cans, and scrap metal to benefit the Inter-Community Services Care-N-Share food pantry, Community Missions of Niagara Frontier, and Heart, Love, and Soul | If you'd like to help, email sarkeesa@yahoo.com or stop by Porter Empty Return for more information. To donate to the Rudy family, click here. To learn more about the NYE First Night Celebration at the Buffalo Convention Center, and to buy tickets, click here. To learn more about car seat safety classes offered by catholic health, click here. The Buffalo Fan Wall of Fame will annually honor a devout and longtime Buffalo fan. Click here to nominate someone who you think deserves to be on the wall. Donate to Response to Love Center by clicking here. A clinical trial looking at an innovative immunotherapy option for patients with metastatic breast cancer is likely days away from opening at Roswell Park | Click here to learn more about the clinical trials happening there. Find more on It's A Wonderful Life here. To find the GoFundMe page for a Niagara Falls family whose home was badly damaged in a fire | Click here. For tips from the NYS Thruway Authority on dealing with cashless tolls for rental cars | Click here. Read more about the West Seneca Central School District's new capital project here. To learn more about what Kelly's Country Store has to offer, click here. Find the Buffalo Olmsted Parks Conservancy survey here. Click here to learn more about everything you can enjoy at Canalside this season. To watch James Walsh's funeral on Watermark Wesleyan Church's Facebook page, click here. The U.S Postal Inspection Service has this detailed list of tips for making sure your package does not fall in the hands of "porch pirate" after it gets delivered. A free shuttle is running up and down Elmwood Avenue for Small Business Saturday shoppers | Click here for more details about where to catch the bus and what you can find along Elmwood this weekend. The Ice at Canalside opened today for the first time this season, with new bumper cars. | Click here for hours and pricing information. Businesses on the Elmwood Strip are offering special Black Friday sales from 9 a.m. until 1 p.m. and are taking part in a Boutique Crawl punch card promotion all day. | Click here for more information. See the new renderings for Buffalo's Outer Harbor here. Hearts for the Homeless is celebrating a major expansion to help serve more families in need | Click here to learn more about how you can help. To learn more about the programs Catholic Charities provides, click here. Western New Yorkers have voted to say Aunt Millie's serves up Buffalo's Best Pie | Click here for more information. Learn more about the Holland Land Office Museum here. Watch the "Come to Buffalo" video here. A new candy made in Niagara Falls is made from Triscuits dipped in chocolate. | You can order it by phone at 716-304-6803 or by clicking here. A local musician created a song called 'Come to Buffalo' after he was upset with negative rhetoric he was hearing about people. He wants to get across that the City of Good Neighbors is a welcoming community, and that people are people. | Click here to listen/watch the music video. The Girl Scouts of Western New York are holding their annual Join-A-Thon campaign from 8 a.m.-8 p.m. for girls ages 5-17 to join or women 18 or older to sign up as volunteers. | Call 1.888.837.6410 orvisit www.gswny.org for more information. Today is the first day to apply for HEAP and assistance from National Fuel. |Click here for HEAP and Click here for National Fuel. For more information on the NYS Dept. of Health's guidelines for closing a nursing home, click here. Learn more about art at Utica Street station | Click here. The Cascades of Fire international fireworks competition is taking place over Niagara Falls at 9 p.m. on November 9, 10, 11, 16, 17 & 18. | Click here for more information. Find more information on WNY Heroes here. After getting called, the 'laughing stock of the NFL,' Bills fans came together to raise money for kids with cancer | Click here to donate to Bear Necessities Pediatric Cancer Foundation. There are lots of deals and freebies out there for veterans this Veterans Day | Click here for the WNY list. DinoFEST returns to the Buffalo Museum of Science Saturday | Click here for details and to buy tickets online. For the NY Attorney General's tips on hiring a mover | Click here. Christmas in the Country returns to the Hamburg Fairgrounds this weekend | Click here for more information. Information on Warm Up WNY can be found here. Good Neighbor Dog Walkers is offering a unique service to brides and grooms in Western New York. The company will dogsit your pup during your big day, and more. | Click here for more info. The first of three distribution events for the Coats 4 Kids Drive is happening this Saturday at the Knights of Columbus, in Kenmore. | Click here for more info. In our special Halloween edition of Buffalo's Best, Western New Yorkers have voted to say the Hinsdale/Dandy House in Cattaraugus County is Buffalo's Best Haunted Place | Click here for more info. 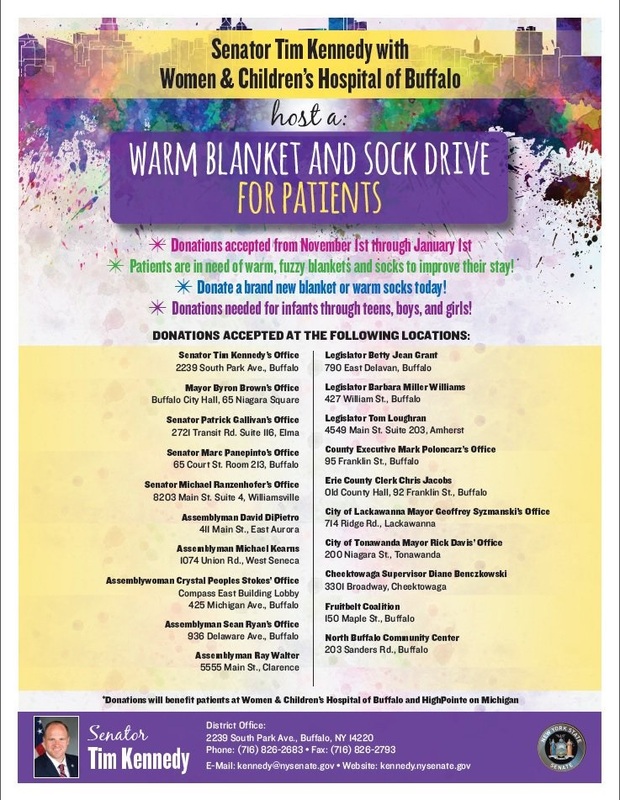 Find out where and when the Coats 4 Kids jackets will be distributed here. Read the NYS Association of County Health Officials' stance on the legalization of marijuana here. Qualified candidates interested in working for the State Department of Transportation can learn more here. To support the Buffalo City Mission's Next Century campaign, click here. The Cheektowaga Town Board held a public meeting over the town's tenative 2019 budget. | Click here to read the budget. A local theater company opens in their new space at 456 Main Street, this Friday. | Click here for a look at their schedule. After a 5 year old with autism mistook a bride for Cinderella at Akron Falls park, community members have started a GoFundMe page to help send little Layla Lester to Disney World to meet all the Dinsey princesses | Click here to donate. There will be two more Public Meetings on the Erie County Parks Master Plan. Those meetings will be held on Saturday, November 3rd, from 10:00 AM – 12:00 PM at Ellicott Creek Park Friendship House and on Thursday November 15th, from 6:00 PM – 8:00 PM at Como Lake Park Casino. Western New Yorkers have voted to say Pumpkinville is Buffalo's Best Pumpkin Patch | Learn more about it here. Jingle Falls USA is coming back to Niagara Falls, with an expanded schedule and an ice rink right in the heart of the city. | Click here for more information. Mikah Meyer is looking to beat a world record, and make it to all 417 national park service sites in three years. He's a professional singer, and is paying for the trip by performing across the country | Click here for more information on his upcoming Buffalo performance. A WNY native has helped save more than 250 pets that have been abused in Cartagena, Colombia | Click here to learn more about Cartagena Paws. Community Missions of Niagara Frontier, Inc. and the Niagara Falls Memorial Medical Center are hosting an Interfaith Community Prayer Service for Mental Illness Recovery & Understanding on Tuesday at 3:30 p.m. at the First Congregational United Church of Christ, 822 Cleveland Avenue, Niagara Falls | Click here for more information. The Chief Operating Officer of Invest Buffalo Niagara was recently named one of North America's top 50 economic developers. | Click here to learn more about her organization's work. A Buffalo family is selling blue pumpkins, in honor of LT. Craig Lehner. All the proceeds go to the BPD K9 unit | To buy one, go to this address: 118 W. Woodside Avenue, Buffalo. The Buffalo International Film Festival is now underway. There are 125 films being shown at four locations in Buffalo | Click here for ticket information. Western New Yorkers have voted to say Becker Farms is Buffalo's Best Place for Apple Picking | Click here to learn more about it. For the Attorney General's online consumer complaint form for the Bureau of Consumer Frauds and Protection | Click here. The House of Horrors & Haunted Catacombs is open for the 2018 season | Click here for information. If you, or someone you know, is in an abusive situation, you can call the National Domestic Violence confidential hotline at 1-800-799-7233 | Click here for more information. Information on the Honey Harvest Festival can be found here. Assessment of the potential impact of regulated marijuana in New York State. An associate chemistry professor at UB started the U.S. Crystal Growing Competition five years ago, and each year it grows | Click here to learn more, or sign up. A martial arts studio in Amherst is trying to combat bullying at local schools by selling T-shirts that say, 'Bullying Stops with Me,' and having kids sign waivers, promising they'll never bully | Click here for more info. Fright Fest 2018 begins at Darien Lake this weekend | Click here for more info. Eight dollars from every 'Hurdle Ave' shirt sold will go to a local family in need | Click here to order from 26shirts.com. Find tickets for the Fall New York State Yoga Festival at Letchworth State Park here. 43North is ramping up to its fifth annual $5 million start up competition with live pitches October 3 at Shea's | Click here for free tickets. For information on stopping robocalls | Click here. Erie County has released a report related to the potential redevelopment of the Buffalo Niagara Convention Center. Click here to read the report and comment on the future of the convention center. Jericho Road cut the ribbon on its new medical suite at 1021 Broadway on Buffalo's East Side | Click here for more information about Jericho Road's medical services. Register for the "telephone hall" presented by the FCC and AARP here. The Buffalo Museum of Science recently reopened its Artifacts Gallery with the popular Chenrezig Mandala back on display | Learn more about everything the museum offers by clicking here. New Era Field has become the second NFL stadium in the country to become a certified Sensory Inclusive space | Click here to learn more about the sensory inclusion bags available to guests for free. The Buffalo Museum of Science is hosting BubbleFEST Saturday for the whole family | Click here for information and to buy tickets. For more information on SandDancer Canine Swim Therapy and Fitness, click here. Amherst native, Mike Lempko, is rollerblading across the country for No Kid Hungry. To donate to his cause | Click here.